There is much to like about Rob Ducey, and his connection to the Blue Jays. 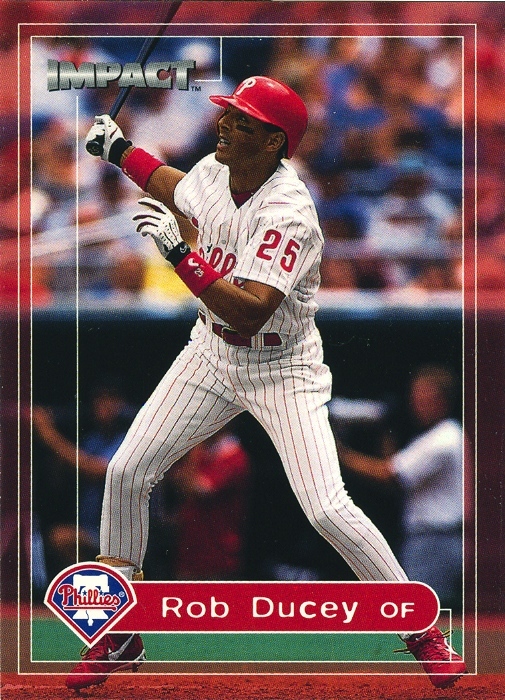 Not only did he play for them early in his career, years before first joining The Fightins, he actually DHed in a couple games for the Phillies against the Jim Fregosi-managed Blue Jays in 2000. Then, later in the season, he managed the rather neat trick of getting traded to the Blue Jays, only to be traded back to the Phillies 12 days later. It’s not uncommon for players to have multiple stints with the same team over their career, but 12-day turnarounds are something special. 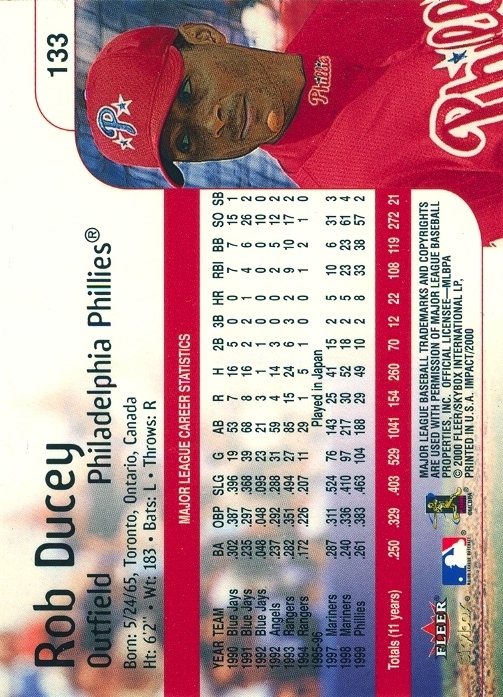 Even more special is this particular Ducey card: 2000 Fleer Impact, #133. First of all, the name of the set: Fleer Impact. Now, if I’m going to assemble a checklist for a set by that name, I can assure you that these players have somehow made an impact. Looking at the numbers on the back of the card, there’s nothing that screams “impact” player. In fact, his 1999 numbers translate to a 109 OPS+. Slightly above-average? Certainly. Impact? With only 227 plate appearances it’s hard to argue for that particular adjective for his performance, but there weren’t exactly that many Phillies in 1999 0r 2000 who were worthy of the label. However, you don’t want to complain too much, because it’s his only card not issued by the Phillies that year. Topps was still in its minimalist phase with its flagship brand and wouldn’t release a card of him in a Phillies uniform until 2001, when he was in his third season with the club. In fact, during those three seasons, he appeared on just three cards issued by the major trading companies.